Welcome to Bespoke Furniture Creations, a Cabinet Makers established in 1989. Always striving for perfection, aiming to create bespoke furniture which not just reaches, but surpasses the customers expectations. Taking pride in sourcing the best materials and designing each piece of furniture to suit the individual, down to the most minute detail, is what the company bases its reputation on. Not only can a piece of furniture be made to a completely new design, it can also be matched to any existing style, design or colour. I had fallen in love with a bespoke kitchen design spied in the window of a London showroom. Very seriously tempted but also seriously beyond my budget, a good friend recommended I contact Barry. Barry recreated my dream kitchen, matching style, the perfect finish, and interpreting precisely the look I visualised. We extended the brief to include the adjoining utility area. In fact it became a really fun project, we worked closely together, Barry recognising my perfectionist streak, and adding much appreciated finishing touches. I am delighted with the final effect and am thoroughly enjoying my new kitchen, I think my cooking has been inspired too! I had the good luck to come across Barry about 6 years ago whilst he was working for a friend of mine. I needed new wardrobes at that time and he built me exactly what I wanted and the quality was first class, I was delighted and couldn't wait to find some other jobs. He has done work in my kitchen which was brilliant and much admired by my friends. He has just completed a built in bookcase and will be back soon again for another job. I cant rate him highly enough and would recommend him to anyone. He is very reliable, trustworthy and a perfectionist. "Barry has built for me two separate cabinets with TV lift mechanisms, plus a built-to-order large desk unit. All three sets of furniture are flawless and have been finished, not only to what I had in mind, but have exceeded my expectations in terms of design, quality, functionality and professional finish. This is due, not solely to Barry's cabinetry skills, but that he takes the greatest care, to listen to what is being asked, and provides constructive input from a wealth of experience; this from the outset and all the way through to completing the work." 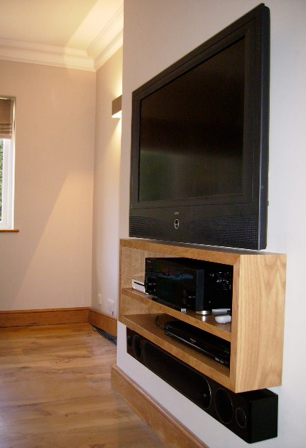 Barry was originally recommended to do some Audio-Visual Cabinet work, which we duly commissioned. The craftsmanship and quality was better than anything we could have bought in a shop and looks absolutely fantastic, including perfectly matching some existing furniture we had. Having seen the quality of this work we then commissioned Barry to construct 2 walk in wardrobes utilising the eaves of the rooms. Again the craftsmanship is so good that it is impossible to tell that these were not in the original house construction. Not only is the work of such a high standard but Barry is also extremely reliable and punctual, delivering on time and going the extra distance to ensure everything is exactly as required. We would recommend Barry for any work of this nature without reserve.